← You better …….Or Else!! About 2 years ago I decided to change my medicine cupboard. This came after using multiple bottles of OTC cough syrups and flu medications for my then 1year old and 3year old. After about 6 weeks I decided to see a local Homeopath and within 7-10days both boys no longer had those persistent coughs. It was then that I made the decision to change to natural alternatives. In the last 2years the boys have not had any pharmaceutical medicines to treat their colds/flu. With the mercy of the Almighty, my older son has only had 1 course of antibiotics in the last 3+ yrs and my youngest, (3 years old) has not had an antibiotic for approximately 2years now. I do believe that sometimes, as in the case of bacterial infections and severe fevers, an antibiotic is a necessity- but I do try to avoid them at all costs. And most infections that children develop are usually viral. Once again this is simply my opinion, and each mum should do what she feels is best for her children, and follow the advice of your family doctor. I am NOT a medical practitioner, and I always advocate that you see a doctor/natural health practitioner when it comes to your children’s well-being. I have decided to compile a list of the products currently in my cupboard. •	Immune Boosters- Prior to the cold season I start the boys on an immune booster- Viral choice or Crecheguard are both wonderful options. The idea is to check that whatever you use has a fair amount of Echinacea in it, to ward or colds and flu. •	Coughs- Pegasus Bronchial Relief eases tight chests, Tibb Chesteeze, Tibb Kofcare, Stodal (Boiron). •	Runny Nose- Pegasus Muco Drainol. •	Flu – Pegasus Colds and Flu, Oscillococcinum (yes it’s a mouthful) made by Boiron. 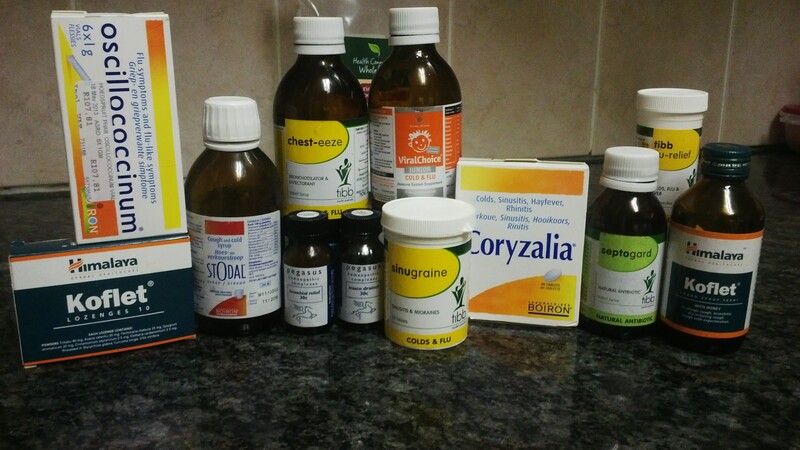 These items are ALWAYS in my medicine cupboard, and I have been using them for the last 2 years now, and do find them effective. I have been using Pegasus Homeopathic Remedies for 3 years and am extremely happy with the results I have had. Pegasus also makes something called Vira-bac which is a natural alternative to antibiotic. And their Blue Box contains all the essential Pegasus products you need in your home. Pegasus is found in all major pharmacies (Dischem/Pharmwell) and local pharmacies stock them as well. Prices are approximately R75 per bottle and lasts quite a long time- definitely worth it. Another natural alternative to antibiotics is Tibb Septoguard. My younger sister Fathima Osman, is currently completing her studies in Natural Medicine in Cape Town and recently introduced me to the “Himalaya” range of products. The throat lozenges have proven to be very effective as well as Koflet for coughs. She will do a guest article for me on Natural Medicine soon. All the above mentioned medicines have a sweet taste and so kids shouldn’t have a problem taking them. I also found that Natura and Homeoforce tissue salts help as well but need to be used over a prolonged period of time for increased effectiveness vs. the Homeopathic medicines mentioned above. The last tip I have is to definitely invest in a Nebuliser and Humidifier. Nebulisers loosen phlegm in the chest and help to expel mucous, while humidifiers help with congestion. Bibz..wats your view on vaccinations?? Thanks for this list! I’m also a fan of alternative medications and try to stay away from antibiotics as far as I can. I’ve been using the Sister Lillian homeopathic range for my one year old but I think I’ll stock up on Pegasus too. As for vaccines, Dr Sears has written “The Vaccine Book” which I found very interesting. He basically goes through an analysis of each vaccine and considers the following: the likelihood of a child contracting the disease, the effects/dangers of the disease if it is caught, the side effects of the vaccine, the ingredients of the vaccine and if there are any alternative makes which don’t carry the harmful ingredients. It’s quite helpful in assisting you to make an informed decision. The only problem is that he focuses on the American vaccine schedule so he doesn’t cover all the SA ones, though they do overlap somewhat. Thanks fatima, I’m happy to be able to help. I also appreciate the Info regarding the book. I will definitely try and get hold of a copy for myself. Keep reading! Take care!